The average EU citizen has a food footprint of 1070 kg of CO2 equivalent per year when emissions from production, land use change and international transportation are taken into account, according to a new study published in the journal Global Food Security. That's about the same amount as the emissions caused by around 6,000 km driven in one passenger vehicle according to the European Commission — and about a third more compared to production-based estimates of greenhouse gas emissions from food. The study found that meat and dairy account for more than 75% of the impact from EU diets. That's because meat and dairy production causes not only direct emissions from animal production, but also contributes to deforestation from cropland expansion for feed, which is often produced outside of the EU. Perhaps surprisingly, the study found that emissions related to international trade were marginal in comparison to other sources. "Tracking the greenhouse gas emissions of food production is extremely complicated, and we need better methods to do this. Our goal in the study was to better understand the climate impact of EU diets, and how international trade affects our accounting of these emissions," says University of Helsinki doctoral student Vilma Sandström, who developed the study as part of the IIASA Young Scientists Summer Program. On the surface, food production appears to be only a small portion of Europe's climate footprint: food production in the EU accounts for less than 5% of global emissions from the agricultural and land use sector. But since Europeans also eat products imported from all over the world, accounting for EU food emissions based only on EU food production leaves out a major piece of the puzzle. 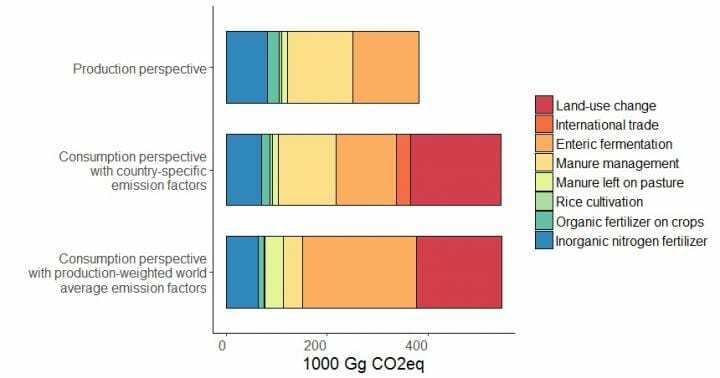 Tracing food origin in greenhouse gas accounting is complex, and many previous studies did not trace the imports or used estimates only for few products or regions. The new study aims to balance depth and scale, providing a systematic approach. The researchers compared a large number of countries, various agriculture products from different origins, and integrated various sources of greenhouse gases. The researchers say the method could also be applicable in other countries and regions. The new study could be useful for decision makers aiming to more accurately quantify greenhouse gas emissions. In addition it highlights the need for better tracking of the impacts of imported food. In particular, this study highlights the impact of imported livestock feed. The research also provides more information for climate-conscious consumers, reinforcing previous research showing that eating less meat and dairy is one of the key actions individuals can take to reduce their climate footprint. "People tend to think that consuming locally will be the solution to climate change, but it turns out that the type of product we eat is much more important for the overall impact," says IIASA researcher Hugo Valin, a study coauthor and Sandström's YSSP advisor. "Europeans are culturally attached to meat and dairy product consumption. Reducing our climate footprint does not necessarily require stopping eating these food products, but rather diversifying further our diets to reduce the share of these." The study authors included researchers from scientists from the Commonwealth Science and Industrial Research Organization (CSIRO) in Australia, and Senckenberg Biodiversity and Climate Research Centre in Germany.